I received Buncee’s premium service in compensation for this post. All opinions expressed are my own. Are you looking for a new online tool to spruce up your business presentations, classroom reports, or online scrapbooks? 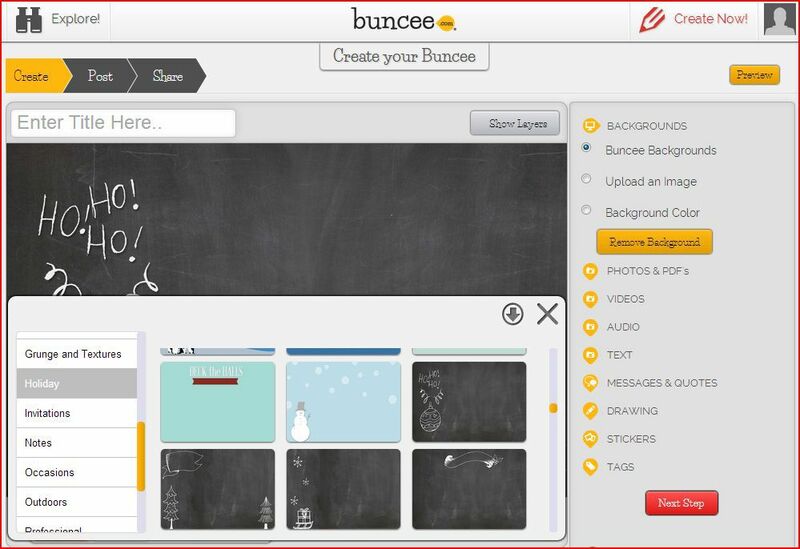 Then you will fall in love with Buncee; new online software designed to help you create stunning multimedia projects. Buncee makes it easy to create and share digital scrapbooks, greetings, invitations, cards, business presentations, and educational resources. With the ability to add photos, videos, music, animation, stickers, and much more, you will enjoy sharing your Buncee creation with your friends and family via e-mail and social media outlets. I am hooked on Buncee. In the few weeks that I’ve known about Buncee, I’ve used it to create Holiday greetings, thank you cards, and event invitations. 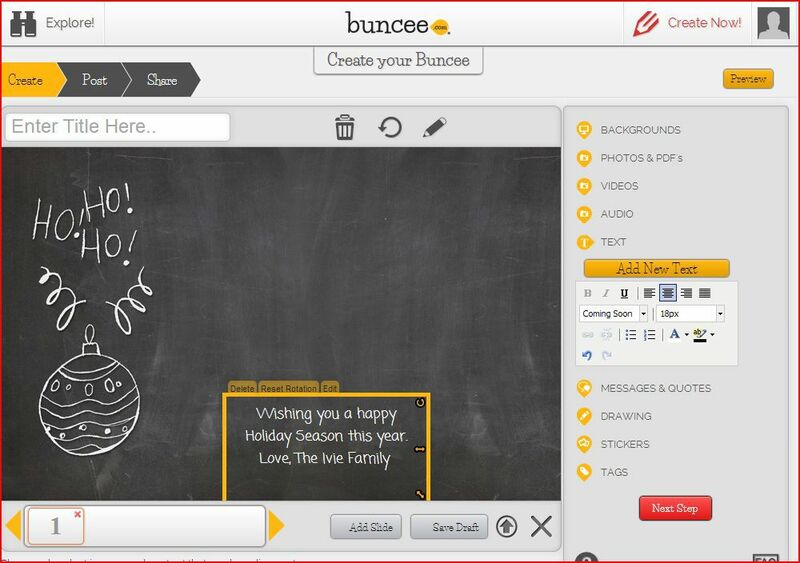 Buncee is extremely easy to use and fun for the whole family. I LOVE Buncee’s modern backgrounds, fonts, and images. Extremely user friendly, I’m able to make and send Buncee greetings in a matter of minutes – I’ve never seen a tool quite like Buncee. Let me take you on my journey of creating a simple Holiday greeting. When you start your Buncee journey, you’ll come across this screen. From the home screen, you are able to view all of your options. On the right hand side, you can see that you have the option of adding backgrounds, images, text, videos, music, etc. The cool thing about Buncee is that you can keep adding slides and make your greetings, presentations, etc as long or as short as you’d like. Able to add different backgrounds and themes to each slide, the possibilities are endless. From this home screen, I chose the “background” option. 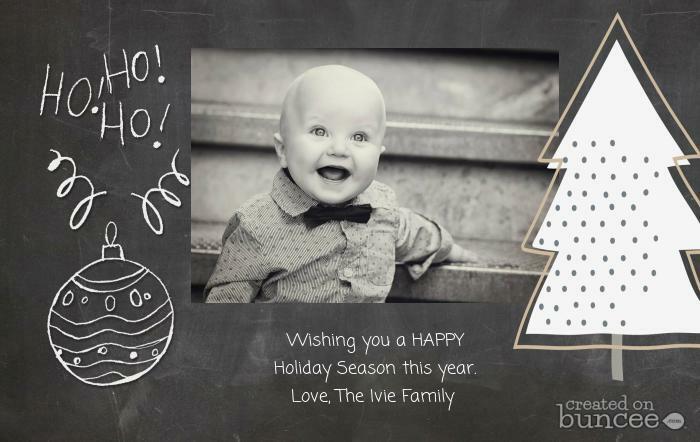 I love the chalkboard look and wanted to incorporate this theme into my Holiday greeting. Although I chose to use a Buncee background, as you can see from the menu on the right, I also had the option to upload a background of choice. After selecting my chalkboard background, I selected the color and type of font I wanted to use. Adding the perfect picture, my Buncee is almost complete. I decided to add a sticker to my Buncee and was finished with my Holiday greeting in about 5 minutes (however, Buncee’s modern design makes my Holiday greeting look like it took me much more time). I enjoyed spreading Holiday cheer by e-mailing and posting my Buncee for all to see. As you can see, I am smitten with Buncee. 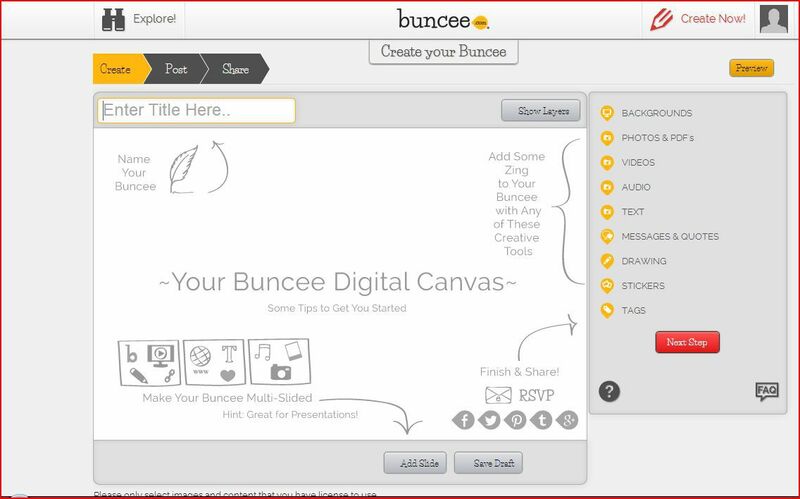 I can’t wait to use Buncee’s innovative multimedia software for many future creations. Everyone can use Buncee’s online service for FREE. Want to give it a try? Visit, www.buncee.com. 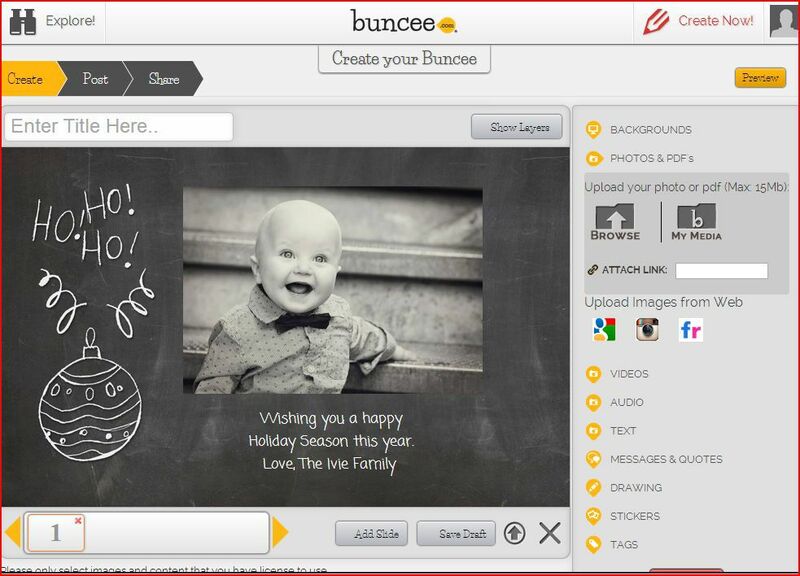 If you are looking for more Buncee options, subscribe to Buncee’s Premium Services ($59.99 for annual subscription). Previous Post: « Baby Monitors Are For More Than Just Babies!